As the name suggests, AC Voltage and current continually alternate. 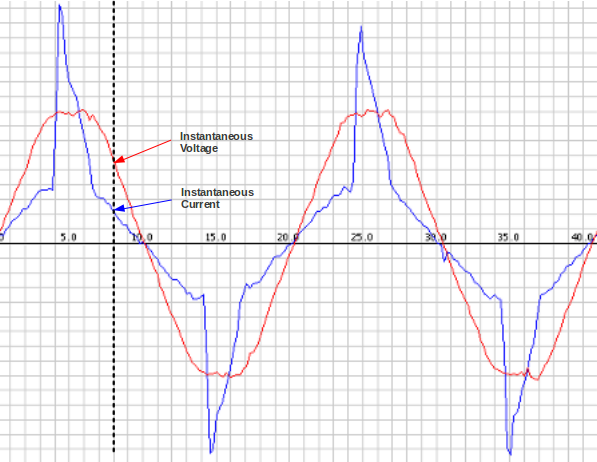 If we draw a picture of the voltage and current waveform over time, it will look something like the image below. Depending on the type of load consuming power, the current waveform - blue in the diagram below - is what you get if you look at a typical laptop computer power supply. (There's an incandescent light bulb present, as well). The image was made by sampling the mains voltage and current at high frequency, which is exactly what we do on the emontx or Arduino. We make between 50 and 100 measurements every 20 milliseconds. 100 if sampling only current. 50, if sampling voltage and current. We're limited by the Arduino analog read command and calculation speed. Each individual sample is an instantaneous voltage or current reading. Real power is the average of instantaneous power. The calculation is relatively straightforward. for (n=0; n// inst_voltage calculation from raw ADC input goes here. for (n=0; n// inst_current calculation from raw ADC input goes here. As RMS voltage is generally a fixed value such as: 230V (+10% -6% in the UK). It's possible to approximate apparent power without making a voltage measurement by setting the RMS voltage to 230V. This is a common practice used by commercially available energy monitors. That's the fundamentals of AC power measurement on the emontx or an Arduino.